There was some serious snoozing going on around here. Mom was supposed to be somewhere all day on Saturday, but her plans fell through. She ended up going to Petsmart for an adoption event. And since one cat was going home, mom took Sonata with her and Sonata is now over there waiting to be adopted. We sure hope her family comes soon....Sonata wasn't too happy about being left at the store. And of course there was lots of goofing around. The kittens are at the into everything and everything is a toy stage....which is a lot of fun. Their momma on the other hand is more into the snoozing-leave-me-alone stage. 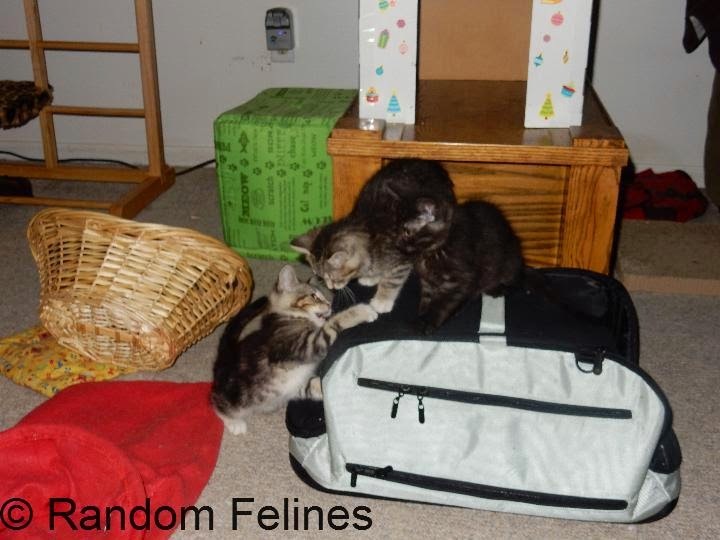 Lots of kitten fun and we sure hope Sonata finds that forever home really soon. Have a great day. Here's hoping that Sonata will get a great home and femily soon. Lots of both play and snoozing makes for a great weekend, we say! I will add Sonata to my prayers, hoping for a quick adoption! Such a lovely name! I too was at a PetSmart for an adoption event on Saturday, and convinced one couple to fill out an application form for Onyx, an adorable black kitten with a slight head-tilt...which makes him look cuter than a bug's ear! We hope Sonata finds a forever home soon. 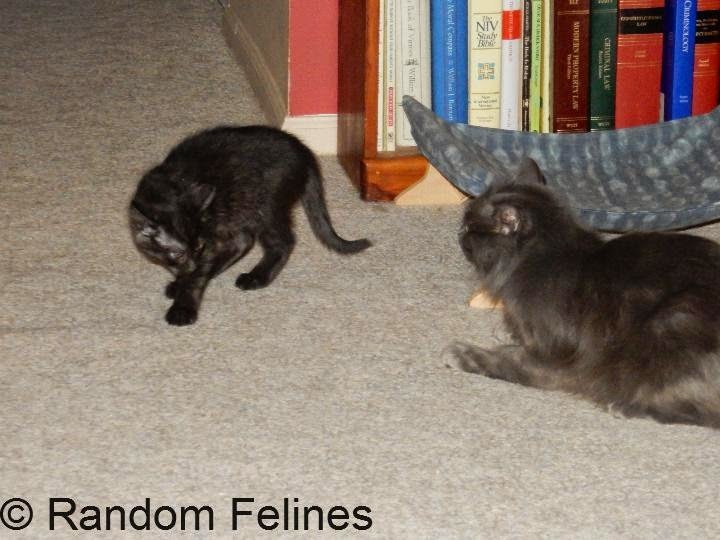 Oh what fun to watch the kittens run around and play! I really hope Sonata gets a wonderful home soon so she doesn't have to stay in the store for very long. Kittens are so cute when they think everything is toy! We hope Sonata doesn't have to be there long before her people show up! There's a "everything is a toy" stage? We still think everything is a toy. You ought to see our fine collection of USB thumb drives we keep under the couch! We hope Sonata gets her forever home quickly. I love that "lots of goofing around" part. I could help you out with that, if ever you need it! Oh yeah we'll just bet Rootbeer got his comeuppance! MOL! I hope Sonata soon gets her forever home. Enjoy them while they're at this fun stage! They'll be gone (and more kittens arriving) before you know it! We'll be purring that Sonata's family finds here soon. Purrs that Sonata finds her home soon! I hope Sonata finds a home really soon! Purrs for Sonata, we hopes she finds her furever home soon. 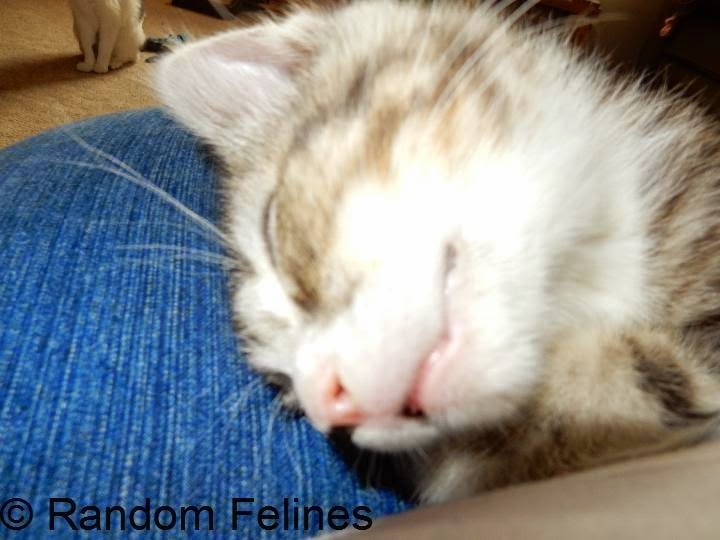 Those kittens a crazy fun...but we admits we is glad they live at your house and not ours, MOL. So Rootbeer was getting a little big for his britches!